^ Ross, Tim. Death of New Labour as Jeremy Corbyn's socialist party begins a period of civil war. 2015-09-12 [2017-12-11]. ISSN 0307-1235 （英国英语）. ^ 2.0 2.1 1994: Labour chooses Blair. BBC. [18 June 2012]. ^ Timeline: Blair vs Brown. BBC News. 7 September 2006 [15 July 2012]. 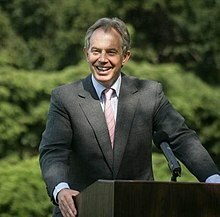 ^ Blair reveals he 'Toyed with Marxism' after reading book on Trotsky. The Guardian. 2017-08-10 [2017-08-10]. ^ 6.0 6.1 Morgan, Kenneth. The Historical Roots of New Labour. History Today. 1 October 1998, 48 (10). ^ Morris, Nigel. Northern Rock, owned by UK Ltd. The Independent. 18 February 2008 [19 June 2012]. ^ Election 2010: First hung parliament in UK for decades. BBC News. 7 May 2010 [10 July 2012]. ^ Election 2010 National Results. BBC News. [10 July 2012]. ^ Gordon Brown 'stepping down as Labour leader'. BBC News. 10 May 2010 [10 July 2012]. ^ Gordon Brown resigns as UK prime minister. BBC News. 11 May 2010 [10 July 2012]. ^ David Cameron and Nick Clegg pledge 'united' coalition. BBC News. 12 May 2010 [10 July 2012]. ^ Cameron's government: A guide to who's who. BBC News. 17 October 2010 [10 July 2012]. ^ David Miliband says New Labour era is over. BBC News. 17 May 2010 [10 July 2012]. ^ Sparrow, Andrew. Tony Blair's A Journey memoir released – live blog. The Guardian. 1 September 2010 [15 July 2012]. ^ Curtis, Polly. Tony Blair: New Labour died when I handed over to Gordon Brown. The Guardian. 8 July 2011 [21 June 2012]. ^ After Smith: Britain's Labour Party is reeling after the death of its leader. (John Smith) (Editorial). The Economist. 14 May 1994 [2 September 2012]. （原始内容存档于2013-11-05） –通过HighBeam. .
^ Stephen Driver. Understanding British Party Politics. Polity Press. 2011: 86–87 [8 May 2016]. ^ Roy Hattersley. Books: Opportunist in blue socks. The Independent. 24 April 1999 [8 May 2016]. ^ Peter Hyman. One Out of Ten: From Downing Street Vision to Classroom Reality. Vintage. 2005: 48 [8 May 2016]. ^ John Rentoul. Tony Blair: Prime Minister. Faber and Faber. 15 October 2001 [8 May 2016]. ^ Andrew Grice. Andrew Grice: The Week in Politics. The Independent. 13 May 2005 [8 May 2016]. ^ Mattinson, Deborah. Talking to a Brick Wall. New Statesman. 15 July 2010 [1 October 2012]. ^ Evans, Geoffrey; Curtice, John; Norris, Pippa. Crest Paper No 64: New Labour, New Tactical Voting? The Causes and Consequences of Tactical Voting in the 1997 General Election. Strathclyde University. [17 July 2012]. （原始内容存档于24 August 1999）. ^ Gower, Dr, Chris. 'New Labour', welfare reform and the reserve army of labour. (Behind the News).. Capital & Class. 22 March 2003 [14 July 2012]. （原始内容存档于2017-12-14）. ^ Reid, Jimmy. The word that is missing from the New Language of New Labour. The Scotsman. 21 October 2002 [13 June 2017]. ^ Grice, Andrew. Architect of 'Third Way' attacks New Labour's policy 'failures'. The Independent. 7 January 2002 [13 June 2017]. Adams, Ian. Ideology and Politics in Britain Today [当代英国意识形态与政治]. Manchester University Press. 1998. ISBN 9780719050565. 保罗·安德森 and Nyta Mann. Safety First: The Making of New Labour [安全第一：新工党产生的过程]. Granta. 1997. ISBN 1862070709. Barlow, Keith; Mortimer, Jim. The Labour Movement in Britain from Thatcher to Blair [从撒切尔到布莱尔时期的英国工人运动]. Peter Lang. 2008. ISBN 9783631551370. Bérubé, Michael. The Left at War [战争中的左派]. NYU Press. 2009. ISBN 9780814799840. Bevir, Mark. New Labour: A Critique [新工党批判]. Routledge. ISBN 9781134241750. Bochel, Hugh; Defty, Andrew. Welfare Policy Under New Labour: Views from Inside Westminster [新工党领导下的福利政策：威斯敏斯特观点]. The Policy Press. 2007. ISBN 9781861347909. Coats, David; Lawler, Peter. New Labour in Power [掌权的新工党]. Manchester University Press. 2000. ISBN 9780719054624. Collette, Christine; Laybourn, Keith. Modern Britain Since 1979: A Reader [现代英国始于1979：阅读者]. I. B. Tauris. 2003. ISBN 9781860645976. Curtice, John; Heath, Anthony; Jowell, Roger. The Rise of New Labour: Party Policies and Voter Choices [新工党的兴起：党的政策与选民选择]. Oxford University Press. 2001. ISBN 9780191529641. Daniels, Gary; McIlroy, John. Trade Unions in a Neoliberal World: British Trade Unions Under New Labour [新自由主义世界中的工会：新工党领导下的英国工会]. Taylor & Francis. 2008. ISBN 9780203887738. Diamond, Patrick. New Labour's Old Roots (Andrews UK Limited, 2015). Driver, Stephen; Martell, Luke. New Labour [新工党]. Polity. 2006. ISBN 9780745633312. Driver, Stephen. Understanding British Party Politics [理解英国政党政治]. Polity. 2011. ISBN 9780745640778. Else, David. England [英格兰]. Lonely Planet. 2009. ISBN 9781741045901. Elliot, Gregory; Florence, Faucher-King; Le Galès, Patrick. The New Labour Experiment: Change and Reform Under Blair and Brown [新工党的实验：布莱尔与辩论领导下的改变与改革]. Stanford University Press. 2010. ISBN 9780804762359. Fairclough, Norman. New Labour, New Language? [新工党，新话语？]. Taylor & Francis. 2000. ISBN 9780415218276. Faucher-King, Florence, and Patrick Le Gales, eds. The New Labour experiment: change and reform under Blair and Brown (Stanford UP, 2010). Fielding, Steven. The 1974-9 Governments and 'New' Labour. (编) Seldon, Anthony; Hickson, Kevin. New Labour, Old Labour: The Wilson and Callaghan Governments 1974–1979 [新工党，老工党：威尔逊和卡拉汉政府1974-1979]. Routledge. 2004. ISBN 978-0-41531-281-3. Foley, Michael. The British Presidency: Tony Blair and the Politics of Public Leadership [英国总统制：托尼·布莱尔与公共领导的政治]. Manchester University Press. 2000. ISBN 9780719050169. Foley, Michael. John Major, Tony Blair and a Conflict of Leadership: Collision Course [约翰·梅杰、托尼·布莱尔和领导力冲突：冲击理论]. Manchester University Press. 2002. ISBN 9780719063176. Garnett, Philip; Lynch. Exploring British Politics [英国政治初探]. Pearson Education. 2007. ISBN 9780582894310. Hale, Sarah; Leggett, Will; Martell, Luke. The Third Way and Beyond: Criticisms, Futures and Alternatives [第三条道路及其他：批评、前途和替代品]. Manchester University Press. 2004. ISBN 9780719065996. Hickson, Kevin; Seldon, Anthony. New Labour, Old Labour: The Wilson and Callaghan Governments, 1974–79 [新工党，老工党：威尔逊和卡拉汉政府1974-1979]. Psychology Press. 2004. ISBN 9780415312820. Kettel, Steven. Dirty Politics? : New Labour, British Democracy and the Invasion of Iraq [肮脏政治？新工党、英国民主和入侵伊拉克]. Zed Books. 2006. ISBN 9781842777411. Kramp, Philipp. The British Labour Party and the "Third Way": Analysing the Ideological Change and Its Reasons Under the Leadership of Tony Blair [英国工党与“第三条道路”：布莱尔领导下的意识形态变化及其原因分析]. GRIN Verlag. 2010. ISBN 9783640750337. Laybourne, Keith. British Political Leaders: A Biographical Dictionary [英国政治领袖：传记词典]. ABC-CLIO. 2001. ISBN 9781576070437. Laybourne, Keith. Fifty Key Figures in Twentieth-century British Politics [20世纪英国政治中的50位关键人物]. Routledge. 2002. ISBN 9780415226769. Lees-Marshment, Jennifer. Political Marketing: Principles and Applications [政治营销：原则与应用]. Taylor & Francis. 2009. ISBN 9780415431286. Minkin, Lewis. The Blair Supremacy: A Study in the Politics of Labour's Party Management (Manchester University Press, 2014). Newman, Bruce; Verčič, Dejan. Communication of Politics: Cross-Cultural Theory Building in the Practice of Public Relations and Political Marketing [政治传播：公共关系与政治营销实践中的跨文化理论建构]. Routledge. 2002. ISBN 9780789021595. Powell, Martin. New Labour, New Welfare State? : The "Third Way" in British Social Policy [新工党，新福利国家？英国社会政策中的“第三条路”]. The Policy Press. 1999. ISBN 9781861341518. Rawnsley, Andrew. The End of the Party: The Rise and Fall of New Labour (Penguin, 2010). Powell, Martin. Evaluating New Labour's Welfare Reforms [新工党福利改革评估]. The Policy Press. 2002. ISBN 9781861343352. Rubinstein, David. The Labour Party and British Society: 1880–2005 [工党与英国社会：1880-2005]. Sussex Academic Press. 2006. ISBN 9781845190569. Seldon, Anthony. Blair's Britain, 1997–2007 [布莱尔的英国，1997-2007]. Cambridge University Press. 2007. ISBN 9780521882934. Tunney, Sean. Labour and The Press: From New Left to New Labour [工党与新闻：从新左派到新工党]. Sussex Academic Press. 2007. ISBN 9781845191382. Squires, Peter. Asbo Nation: The Criminalisation of Nuisance [反社会行为国家：滋扰罪]. The Policy Press. 2008. ISBN 9781847420275. Vincent, Andrew. Modern Political Ideologies [现代政治思想]. John Wiley & Sons. 2009. ISBN 9781405154956.